Congratulations to the entire team for a terrific local project. Spanning 375,000 square feet, the new high school features flexible classroom space, administrative offices, a performing arts/blackbox theater, gymnasium with FEMA Storm Shelter, cafeteria, football stadium, tennis courts, track and soccer fields. The building is separated into 14 unique areas. Portions of the tilt-up walls were used as retaining walls while some were projected as large cantilevered parapets. The performing arts center uses segmented panels to create a curved wall that was used as a decorative element in the building design and finishes. 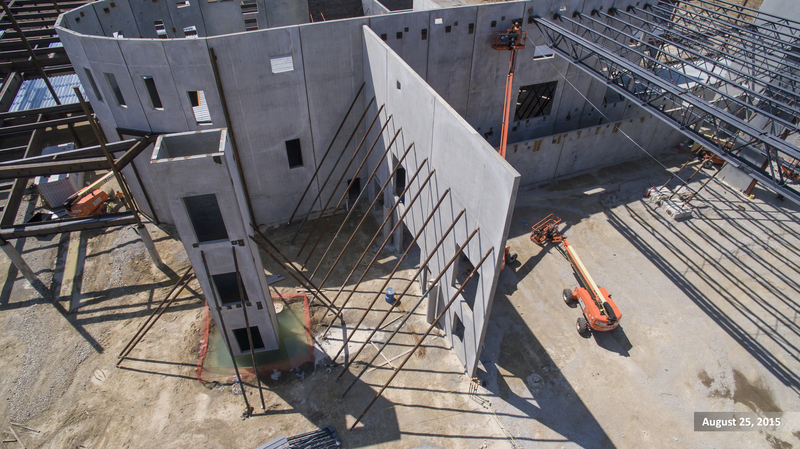 Load bearing concrete tilt-up panel wall systems were used to resist gravity and lateral shear forces on the three-story classroom wing. The forces were collected from the roof and the third floor diaphragms through stair and elevator shafts and then redistributed to a podium style second floor diaphragm and to additional lower level shear walls. The lower level areas were also required to be hardened storm shelter areas requiring 250 mph wind resistance. The entry, corridors, common spaces and cafeteria of the new, state of the art high school was finished with polished concrete topping slab. The contractor and the architect worked together to meet the design intent. The finished product provides a beautiful, low maintenance floor that is an amazing testament to quality decorative concrete.